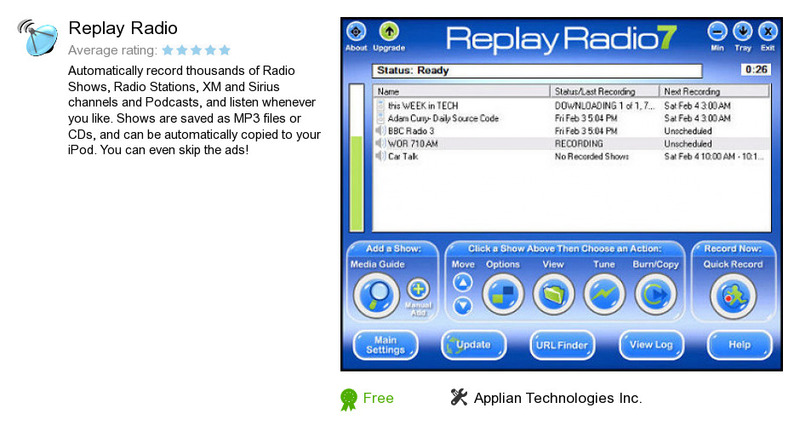 Replay Radio is a program developed by Applian Technologies. We know of versions 9.1, 9.0, 7.3, 7.1, 7.0, 6.1, 6.0, 5.3, 5.2, 5.1. Version 9.1 is downloadable at our site. Replay Radio distributive has a size of 19,696,194 bytes. It works with the following extensions: rr. Applian Technologies also publishes Replay Converter and WM Recorder.